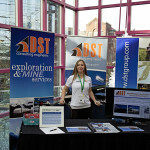 DST was a gold sponsor of this year’s NCWiE held in beautiful Vancouver, British Columbia. The theme of the conference was ‘Add Your Piece to the Puzzle’ and we were excited to contribute a captivating and motivating conversation keynote as our puzzle piece. 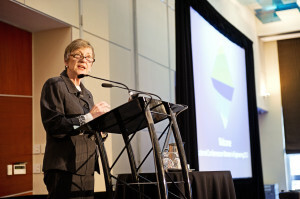 DST board member Margaret Kelch was honoured to represent the firm at NCWiE and speak to engineering students from across Canada on how to manage and thrive on change. By sharing anecdotes from her own career she encouraged and inspired the audience to be true to themselves, to get out of their comfort zone, to work hard and lastly, but most importantly, to network. And, network they did. Students who attended the conference were able to hone their business networking skills at the NCWiE Career Fair where businesses, including DST, welcomed the opportunity to speak with delegates. DST representatives met with many ambitious engineering students who were keen to learn more about job opportunities with the company. The final piece that DST contributed to NCWiE was a prize giveaway. We awarded an iPad Mini to one lucky delegate chosen from the many who visited our booth at the Career Fair. 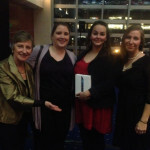 At the closing gala dinner we awarded the prize to Simone Lemieux, a mechanical engineering student at Dalhousie University in Halifax, Nova Scotia. Congratulations Simone!